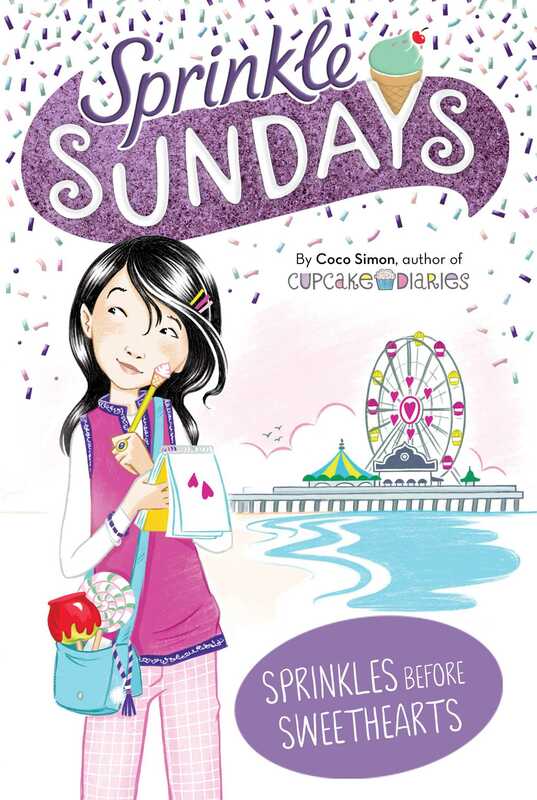 Tamiko, Allie, and Sierra focus on ice cream rather than crushes in this fifth delicious book in the Sprinkle Sundays series from the author of the Cupcake Diaries series! “Lunch is gross today,” I said, lifting a piece of limp iceberg lettuce and letting it drop to my plate. I sighed and rubbed my eyes. “Why so cranky?” asked my bestie Sierra as she chomped on some dry-looking carrot sticks. “That’s why you were late to class this morning?” asked MacKenzie, my newer bestie. “Because of baseball?” Her bright red hair was pulled up in a high ponytail, and it swung from side to side as she shook her head and faked her disapproval of me. “You must have been in a rush if you forgot your idea notebook!” agreed Sierra. She tossed her curly brown hair over her shoulder and smiled at someone behind me. “Hey, girls!” she said. I turned around to see Margie and Emilia, two girls from our grade, bearing down on our table. I liked them fine—we were in art and science together—but they weren’t my BFFs or anything. “Mind if we join you?” asked Margie. “Go for it,” I said, sweeping my arm toward the empty seats at the table. “Thanks,” said Margie, setting down her tray with a smile of satisfaction. “Oh, just brainstorming about the midterm project we need to make for science,” said Margie, looking at Emilia. Emilia nodded, but it seemed like there was something they weren’t saying. I cleared my throat. “I love making them!” I said. It was true. I was all about crafts and DIY and would waaaay rather create a project than write a paper about something. “What is your class’s assignment?” asked Sierra. We were in different physics sections, with different teachers. I shrugged. My fingers itched to start sketching in my idea notebook, but I didn’t have it today, of course. “I dunno. I’m not sure yet.” I wouldn’t have given out my ideas anyway, but I hadn’t actually had any inspiration yet. Emilia nodded, looking down at her plate of yucky food. “If it’s something about art class, I cannot help you there. Mr. Rivera—ugh! That man is a robot! I have no idea what he is looking for—” I began. “Do you want me to explain?” Margie asked her. Emilia nodded shyly. At this point I was getting annoyed. These two had sat down and taken over my conversation with my two pals, and then one of them couldn’t even speak for herself. “What’s going on?” I pushed. “Eeek!” Emilia squealed, blushing an even darker shade of red. Emilia put her face in her hands and shook her head. No one would mistake this girl for someone pushy, so I wasn’t sure what she was worried about. “In the know about what?” See, Margie? Ask a direct question if you want an answer from someone. In the know? About guys? I had some good guy friends from the cross-country team, but I didn’t have a crush on any of them. And it was true that I loved dressing fashionably, but that’s always been for me?—I wasn’t dressing to impress anyone. Emilia nodded. “Thanks for listening,” she added shyly. We wrapped up lunch, and then Margie and Emilia left to go track down poor Carlo somewhere near the lockers. MacKenzie, Sierra, and I stood and went to clear our trays. “That was weird,” I said, still puzzled. “Beautiful eyes? Dazzling smile? Carlo?” Sierra said, and giggled. “Wasn’t it funny how it’s Emilia who has the crush, but Margie did all the talking?” said MacKenzie. Even so, I couldn’t imagine being in such a state that my friends would have to do all the talking for me. I was no love expert, but I knew that it was better to speak for yourself in any situation, thank you very much! I was excited to get home after school and grab my idea notebook. I always had an idea notebook going—there was a whole shelf in my craft room filled to bursting with my used notebooks. I packed them with sketches of projects or crafts I was working on; pictures ripped from catalogs, magazines, or newspapers; ideas for ways to customize things I already had, like clothing or furniture; inspiration for my part-time job at my bestie Allie’s mom’s ice cream parlor, Molly’s Ice Cream; and basically anything creative in my life. It’s where I really let myself go. Being without it today had been like missing a limb. I pounced on it in my room and slipped the clipped pen off the cover to chew on. I had to pen-chew when I thought. It drove my mom crazy because she always thought I was going to chip my tooth. Hadn’t happened yet! The science project was what had my wheels turning. It had to illustrate some simple physics concepts, like force, motion, and velocity. My mom had recently brought home a bunch of spools of colorful wire from one of the labs at the college where she works, and I’d been dying to use them. Now I thought I could put them to use for this project. But how? With my idea due next week, I had time to come up with something really cool. I put my pen to paper and let it roam freely while I thought about other stuff. I doodled hearts as I wondered why everyone was suddenly talking about crushes. I mean, come on, we were only in seventh grade! I doodled ice cream sandwiches as I thought about how much fun we’d had selling this new concoction at Molly’s the day before. I doodled Roman gladiator shields as I thought about my history homework—and then my phone rang. It was Allie herself, calling on a video chat. “Hey!” I cried, accepting the call and grinning at Allie. I could see she was staying at her dad’s that night. She and her brother alternated staying with their mom and dad. There were pluses to both locations. Her dad’s new apartment had a rooftop pool, for one thing! Then we were all three together. “Besties!” I said. Ever since Allie’s parents had gotten divorced and she’d had to move to a new school, the three of us had made an effort to stay close. We worked together at Molly’s Ice Cream shop every Sunday, where we called ourselves the Sprinkle Sundays sisters or the Sprinkle Squad. We video-chatted at least once a day, and we tried to plan one fun thing together every week. Sometimes we missed one of these things, but we tried to keep that from happening. Otherwise we missed one another. Even though I still saw Sierra every day, it was different when it was the three of us. Allie asked me about the World Series (she was very supportive of my hobbies and interests, even though she could not care less about baseball), and after I filled her in, the talk turned to the two school dances she’d just attended—ours at MLK, where Allie used to go to school; and the one at Vista Green, which was her new school. “So, Allie, can we talk about the elephant in the room?” Sierra asked. “What are you talking about?” Allie answered. Colin was one of Allie’s new friends. He was the assistant editor of the school paper at Vista Green, and he’d asked her to write a weekly book review, with an ice cream recommendation to pair with each book. He was also a repeat customer at Molly’s. Every time he showed up, Allie was really glad to see him. And since he kept showing up, I was thinking that maybe, just maybe, he was pretty glad to see her, too. I groaned inwardly as Sierra continued to grill Allie about Colin and whether they had danced together. After a while I began to zone out. I picked up my sketchbook and started drawing daggers into every heart I’d already drawn. The only problem with video chats was, people could tell when you weren’t paying attention! “You mean you’ve never even looked at someone at school and thought they were cute? Or wondered what it would be like to go on a date with them?” Sierra’s dark eyebrows were knitted close together, like she was puzzled by this. Sierra’s eyes roamed around, like she was searching the ceiling of her bedroom for an answer. “So when I’m old and alone, you’ll still be my friends?” I joked. We all started to giggle. “Even when I have no teeth!” Sierra howled. “Gross!” I said, but I was laughing. “Gotta go! Byeeeee!” said Allie, and the call ended. I smiled. Sprinkle Sundays sisters forever!